On December 19, 2009, I taught at Saturday Morning Men's Bible Study, a group that has met at Menlo Park Presbyterian Church at 7:30am on Saturday for decades. 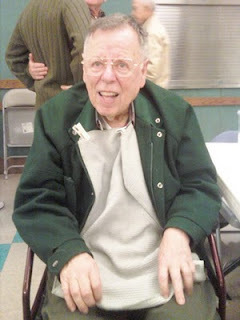 During the prayer time, a man stood up and said that the aged gentleman sitting in wheelchair next to him was Vern Turner, and that he'd asked him to read something he had written, since Vern couldn't read it himself. None of us were expecting what came next, and it has been one of the holiest moments of the last 6 months. About 19 years ago I got up in this group and said "Please pray for me." I have Parkinson's disease. I am not suffering from Parkinson's Disease, I just have Parkinson's disease. I am not afflicted with Parkinson's disease. You live long enough and you get something. I got Parkinson's disease. I could have gotten something else but I got Parkinson's disease. Since that day, you have been faithful to that prayer. Now I can't talk or walk. My grandson asked me why I drool all the time. I can't do much, but I can still pray. May God give you the grace of aging like Vern Turner.